The latest MHR Global remuneration survey shows that the proportion of employees receiving increases in remuneration has returned to the levels recorded prior to the Global Financial Crisis. Managing Director of MHR Global, Kevin McBride, commented “For the first time since 2008, our September survey shows the proportion of staff receiving increases has risen above 80 percent, following a fall to 50 – 60 percent during the height of the GFC. 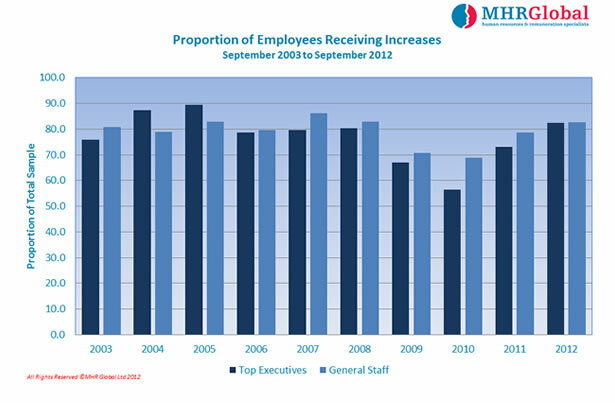 Mr McBride suggested that while the increase in the number of staff receiving increases is a sign that employers recognise the need to provide some level of adjustment to staff facing rising living costs, many organisations continue to feel financial pressures, as reflected in the low level of increases awarded. The survey also reveals that while some high profile Chief Executives may have seen significant increases in the past year, that is the exception, not the rule. 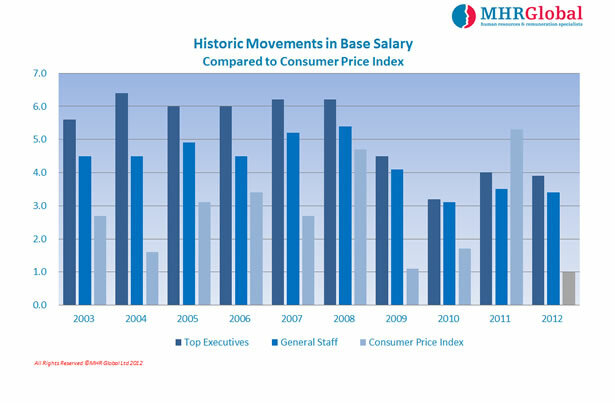 Mr McBride commented that on average, the increases received by Chief Executives were marginally below that received by other Top Executives..